I got this award from Yvonne, just have to write about 7 things I didn't write yet on this blog. 1) I had cats always since I left my parents home. I love ginger cats and had a couple of them. They always had the same name: Pallieter. It is a name of a character in a book of a Flemish author, Felix Timmermans. The character enjoys life as it comes in the rural landscape where he lives. My other cats had unusual names always, currently I have Wellington and Nessie. Before there were Napoleon, Tobias, Loebas, Dikkie Dik. 2) I always manage to cut my fingers using a knife or scissors. I even did it ones while just putting butter on a slice of bread. I was forbidden by DH to even touch the cook's knives in the kitchen. 4) I still work for the same employer where I started when I left school. 5) I have a little pub in the back of my garden where DH could enjoy the last months of his life. There is beer and a lot of whisky. The only thing about it is: I don't drink alcohol! 6) I attended art academy for a couple of years. I wanted to learn drawing and painting. It was not a big succes as we were pushed in a certain direction, could not decide what we really wanted and the basics of drawing weren't thaught properly. I haven't touched paper and pencil since DH died, maybe in the future? 7) I have about 50 penfriends all over the world. We just talk about daily life, what we read, about the kids, what weather it is, it's so nice to find friendly post in your mailbox! Another picture of my three rascals, I can't get enough of those momentos, every picture taken of them is perfect (says proud gran). School has restarted, Jelle goes to school for whole days this year, he likes to eat his sandwiches at school, but is very tired in the evening. Stein has French lessons for the first time, his dyslexia is playing, but he is very persistant and will make it. Robbe is his usual self, an unworried child, I hope it will end well this schoolyear. 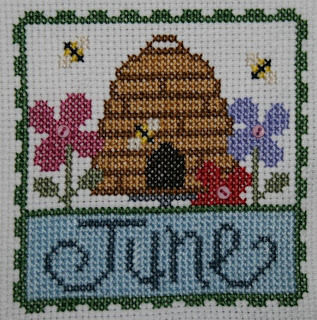 June is the 6th part of the Lizzy Kate SAL, I am busy stitching August at the moment, friday the next part is already coming my way. 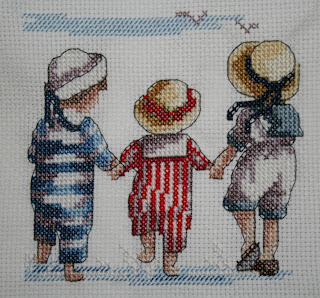 The All our Yesterdays kids are for a Regenboogkussen, the charity I stitch for. The theme of the cushion is the sea and the beach. 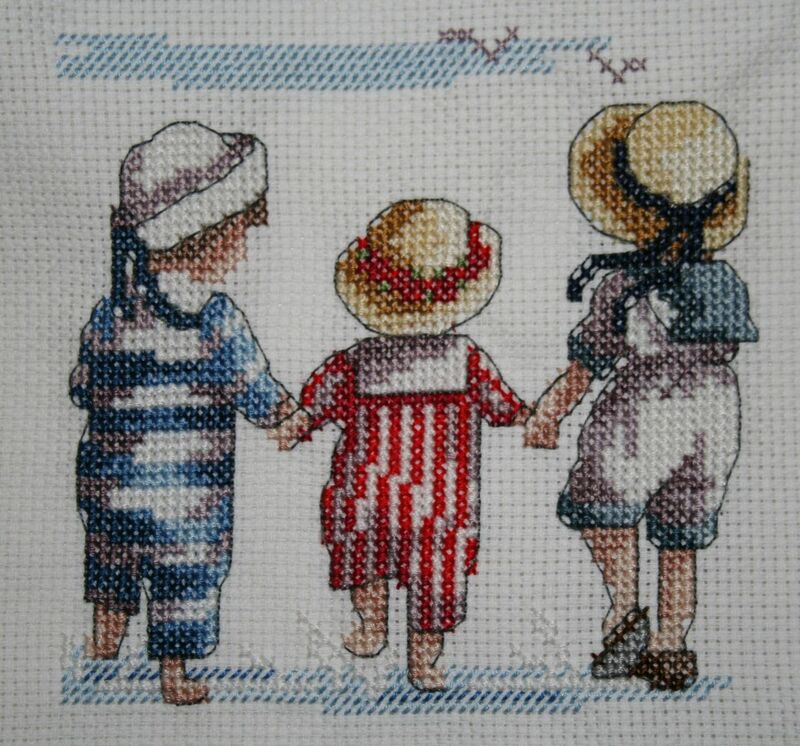 I love the designs, cute and nostalgic. 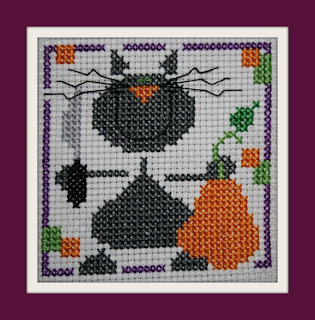 And I stitched my first halloween item for this year, an entrance to autumn, the weather was nice this weekend, it rained tonight and more rain is predicted. 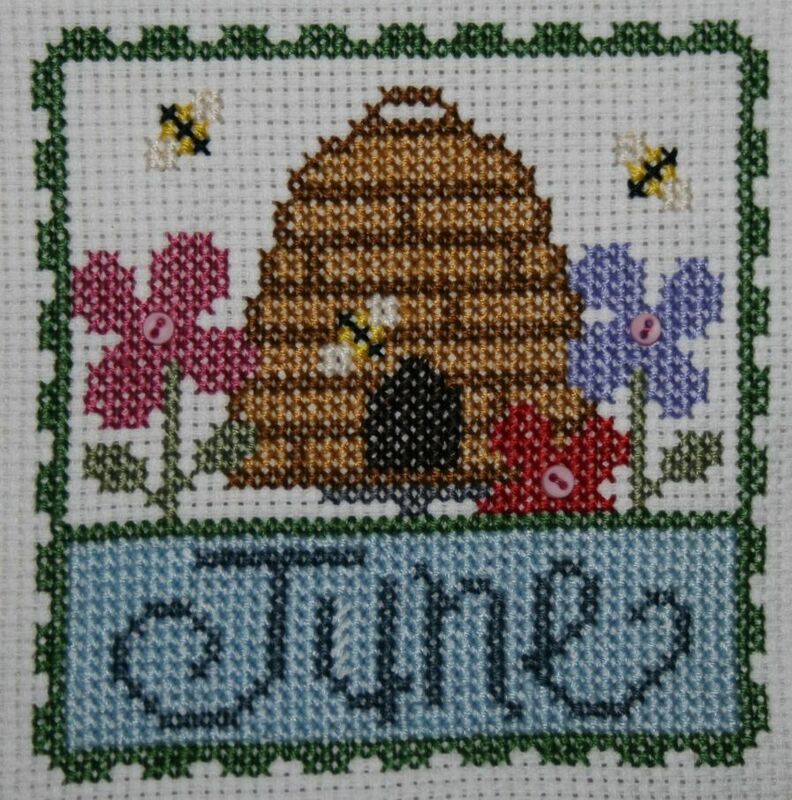 Yesterday evening I had my first gathering with fellow stitchers, met new and interesting people. i did some stitching on the quilt top of the patchwork course (which I wanted to be ready by the end of the holidays), bought some fabric (gatherings in fabric shops are dangerous!) for the quilt Stein ordered. The fabric in the book was in mpain colours, I thought it to be to flat for a young boy, so bought some pattern fabric for the fishes, I don't know what to do yet for the water, will see what kind of fabrics I have in my stash. And of course, I did a lot of talking and watching fellow quilters work. i loved it and am looking forward to next months gathering!